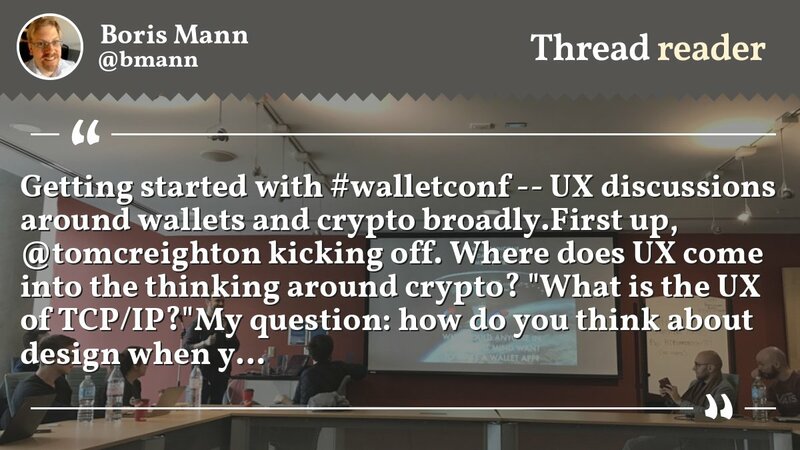 The Web3 UX Unconf was put together by Derek Chiang @derek of Thunder Token and Dan Tsui of Kyokan. The brief / working document was shared by them ahead of time and they reached out / recruited people ahead of time with a web form and direct intros. Many people heard about the event last minute while in Toronto and ended up attending. Please use this to collect links, notes, and other facts of interest. Have a lot of personal things to say? Write a forum post here or external article, and add the link to the Follow Up Posts section at the end. 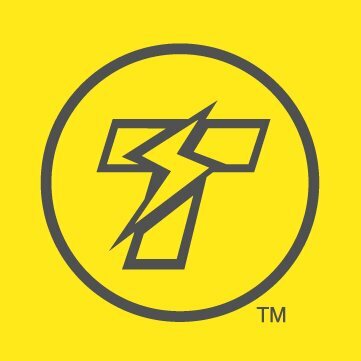 DApps are slow and expensive. Users are getting hacked, phished, and confused. 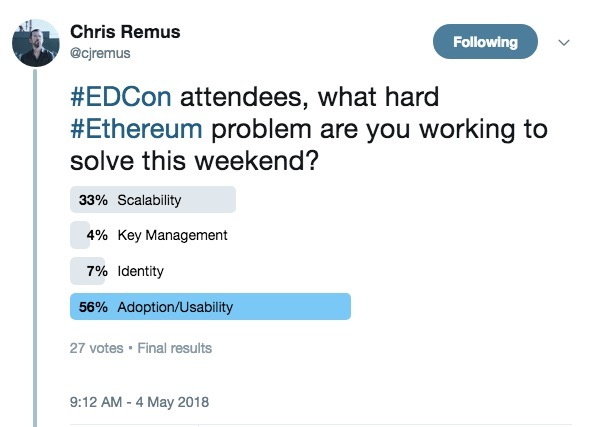 Wallets and dapp browsers are struggling to support all the new sidechains, plasma, and state channels. Developers are overwhelmed by support requests. Let’s sit down and fix this. We invite developers and designers of wallets, dapp browsers, and blockchains to join us. The unconf consists of presentations and unstructured discussions. We hope that by having everyone in the same room, we will be able to have productive conversations and work on important issues together as a community, both during the unconf and afterwards. Derek & Dan and the sponsors should be thanked profusule. They rented the venue, provided catering for all meals, and had projectors and live streaming set up. Cut / paste from the original Google Doc. Feel free to add links to your company or project, any other additional links and please do add yourself – and please include your local forum handle if you have an account! A dozen or so of us went along to @ricburton’s Balance meetup at the Queen & Beaver Pub afterwards. Hey @jpitts can you please make your first post a Discourse “wiki post”? Then we can have one main doc that everyone can edit and add links to. I started drafting one, but realized I didn’t have a trust level that would let me turn it into a wiki page. @derek yes! One of the things I’m writing up in my “how to organize a working group” meeting. Thanks so much for organizing and kicking off this first one. Great idea, I just wiki-ized the initial post. @derek, I added these to the initial post. Perfect – I pasted in the brief and attendees and agenda and such and did some light editing. I wasn’t able to link everyone’s forum names here because it said I could only mention 10 people in a post. I added spaces to a couple just so I could save. Don’t know if you have mod powers that can fix that. And on further thought, twitter handles probably useful as well. Please add yours! Transactions are just actions are just signatures. We need to make it easy to iterate on new signature types (each new network is a new key/signature type). Once we have agreed on protocols for rendering signature types, we can also iterate on how comprehensible we can get them, with tools like radspec etc. Transactions and Interaction are how we separate them. Can we get the videos of the talks? Someone from Kyokan is helping us upload them to YouTube. I will post here once it’s done. So many things around the topic of ‘Transactions/Interactions/Actions/Signatures’ that will be relevant to Kyokan’s clients and I’ve yet to have time to watch the talks. Personally: Beltran’s talk, Finlay’s talk, Burton’s talk, the EF presenters, and radspec stood out to me, in case anyone is looking for highlights. Was also nice to learn more about Casa (their demo was sweet, not sure if anyone else tried). Also, Ric’s comments on funding dynamics for early stage projects will influence how we roadmap/structure our own projects as well. Thanks for that. As this was a bit of an experiement, we’d love feedback on how it was run, attendees, how content was curated, etc. If it’s better for that to be private, please send DMs to Derek or myself. As for me, I feel like there are two directions we could take it. One: open it up as a larger event to be inclusive of everyone who wanted to attend. We just didn’t have space this time around. Two: contain it to a maximum of 30. Say, 12 teams with demonstrable progress + active work in the space, each bringing a maximum of two people: that could help us focus the discussions. Ending earlier in the day and coordinating an official post-event meetup would have been cool – would have loved the opportunity to hang out more with @ricburton but we had to clean up and catch a flight. Shorter talks, making more time for discussion might have been better. If anyone is interested in helping facilitate future events, our ability to do more on this front is limited (Dan running Kyokan full-time, Derek as well for Thunder as it hires/grows/pushing things to prod). Vision would be a coordinator who helps secure funding and plan the events (including post-event tasks like posting the videos). With the funding, we could find 1-2 volunteers from the community to help run the event, these could even come from the participating teams. Optimizing for ‘easier to have productive conversations’ about these topics.